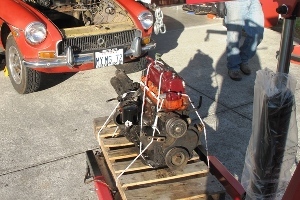 A couple of friends came over on Friday and we took the engine out of the M.G. Nothing gave us much trouble. All the nuts and bolts came free easily, even the exhaust. An amazing number of nuts and bolts were missing, which really helped with the disassembly. We took a few pictures and of course labeled everything carefully, with the idea that this will somehow help us figure out how to put everything back together in the Locost. We'll have to see about that. In a pinch, we always have Google. It's great having the engine and trans all in one piece, ready for cleaning and painting, and it's particularly nice to know they're in running condition and will work as soon as they're plugged into the Locost. But the biggest benefit of having them out of the M.G. was being able to set them up in the mock-up frame. 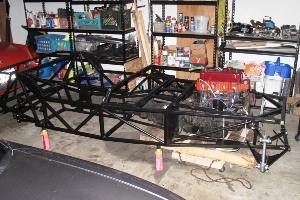 As expected, they didn't immediately fit, however, being wood, the mock-up frame was easily modified, and with a little cutting and taping we were able to get the engine close to where it needs to be in the frame. 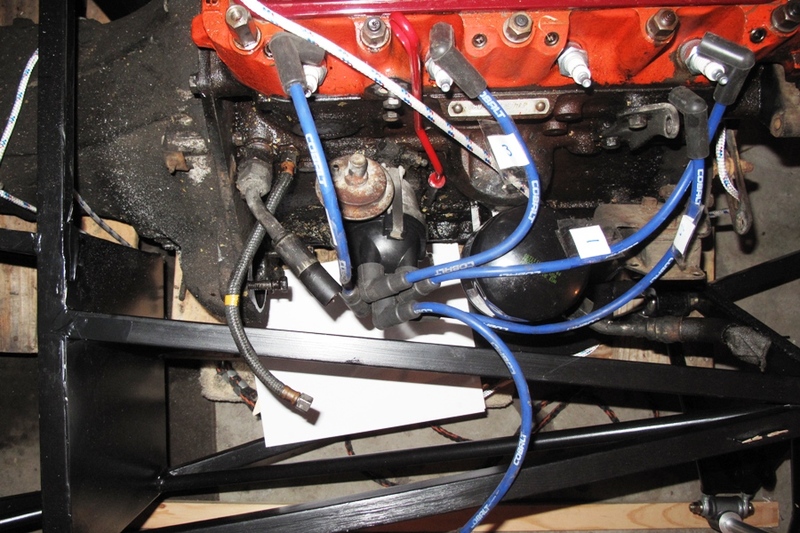 The biggest problem fitting the frame was the triangulation beam in the engine bay, which wants to run straight through the oil filter and distributor. That tube had to go, or at least get moved out of the way. I don't think moving it will compromise the integrity of the engine bay, which has precious little integrity to begin with, and seems to derive a lot of its strength by using the engine as a structural member. In any case we're not removing it completely, just making it less intrusive. Next problem was the transmission tunnel. 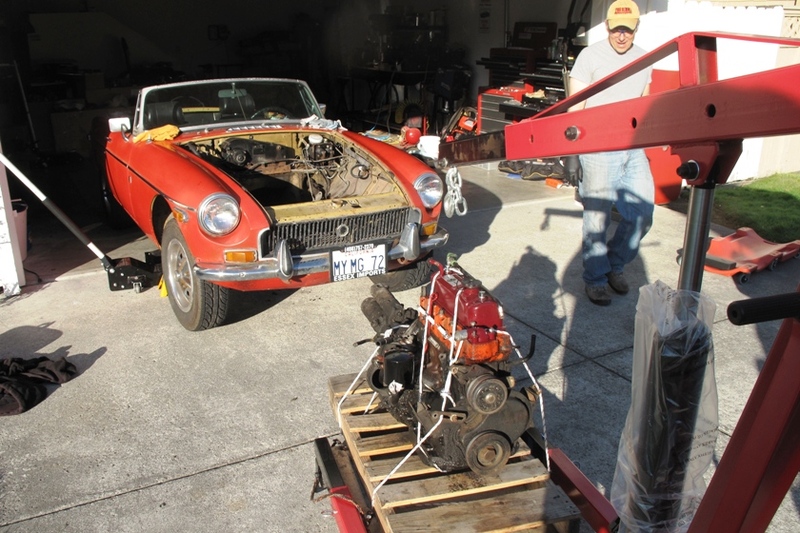 The turret on the MGB gearbox is offset from the transmission's centerline. I suppose this is to give the driver, who of course is sitting on the right, a little more room. In a Locost, there's no such thing as a little more room. So the transmission tunnel will have to encroach into the cockpit nearside, just an inch, which likely won't be missed. We're only going to widen the tunnel next to the transmission. 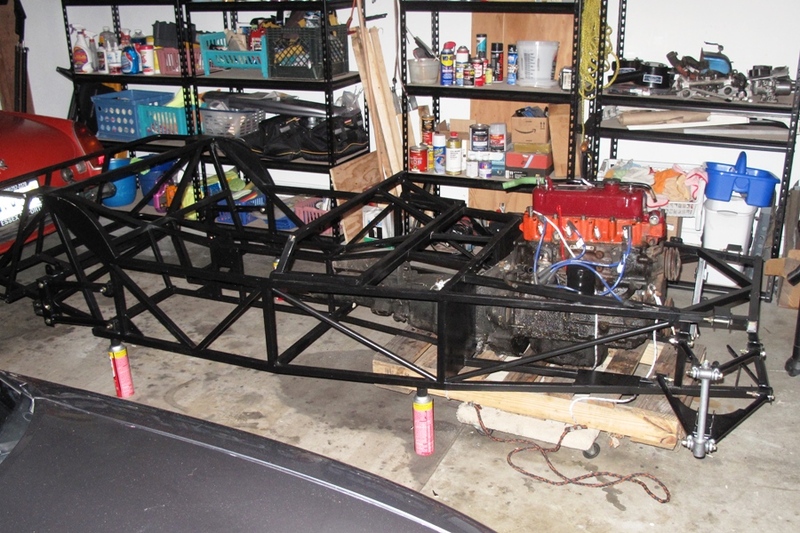 The driveshaft tunnel will be centered, and a more typical 5" wide. 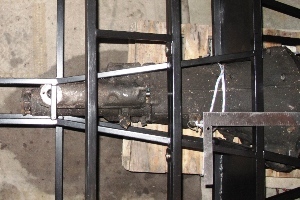 Also getting a makeover is the bell housing opening in the firewall, which is defined by the two center H-tubes, which on the mock-up frame are 10" apart, and on the steel frame will be 13" apart. Luckily, most of that extra space will be confiscated from the passenger footwell, to provide room for the clutch slave cylinder. 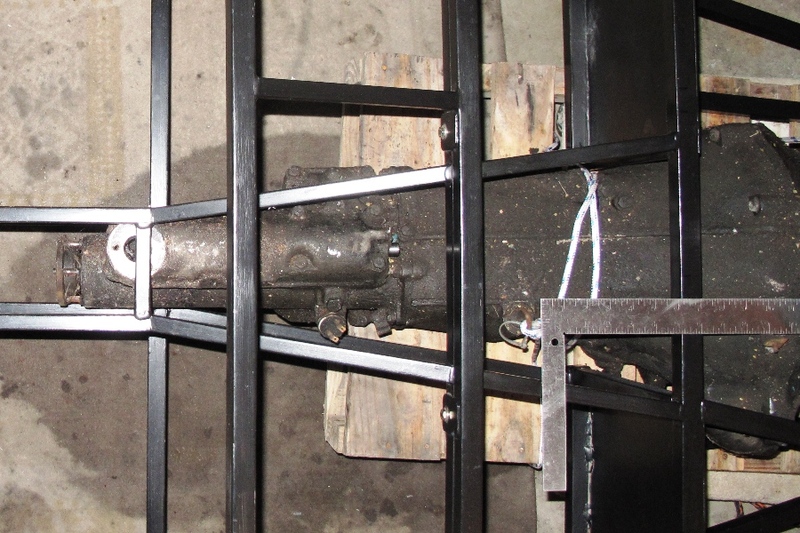 We haven't made these modifications to the mock frame yet, but I'm confident once we do we'll be able to get the engine backplate within 3-1/2" of the firewall, allowing the transmission turret opening to clear the forward transmission tunnel brace. Or so we hope. 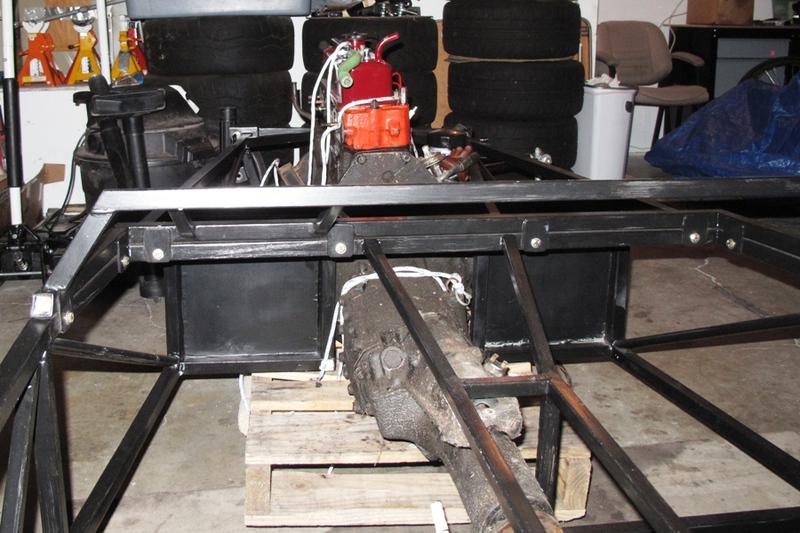 While we had the engine in the frame, we took some measurements of the sump clearance and engine height. 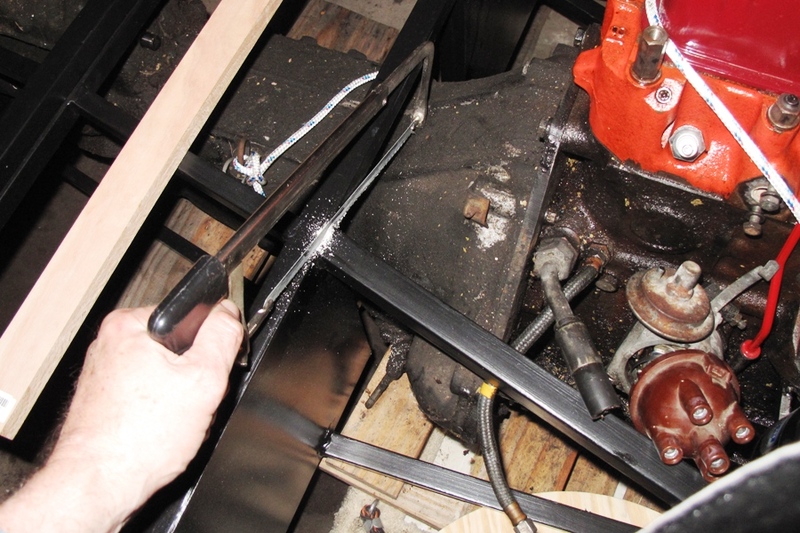 With the frame resting on jack stands (okay, four cans of brake cleaner), the oil pan sat about 3/4" below the bottom frame rails. The top of the valve cover sat 10-1/4" above the upper frame rails, which is 1-1/4" above the hood line. So a 2" bulge over the valve cover is a given. 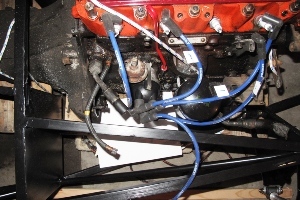 What to do about the heater hose, oil filler cap, distributor vacuum line, carburetor dashpots, and throttle cable is still on the drawing board. Youre so cool! I dont suppose Ive learn anything like this before. So nice to seek out any individual with some original thoughts on this subject. realy thank you for starting this up. this website is one thing that is wanted on the internet, someone with a bit of oragniility. useful job for bringing one thing new to the internet!